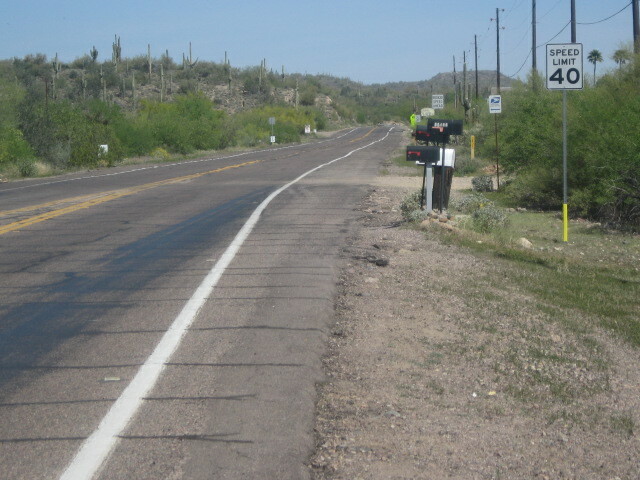 Sunday, March 30, 2014, I jumped in the car, and drove up the freeway to the desert town of New River. 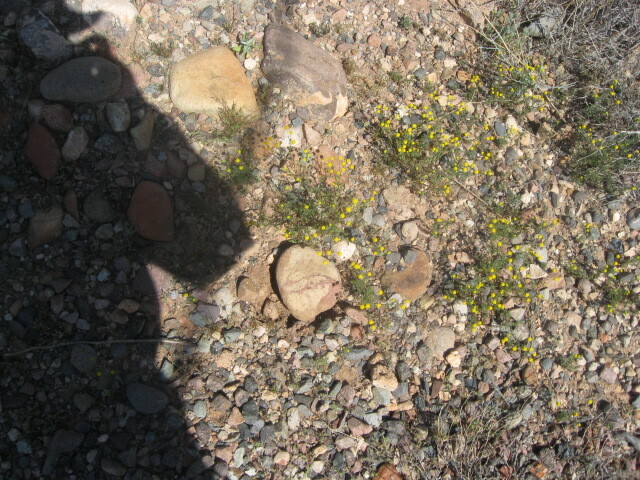 The plan was to hike the desert and look for striped stones, and take some pictures. Didn’t find any striped stones, but I did take some pix, and the plan sort of changed into getting breakfast about halfway through . . . (grin). 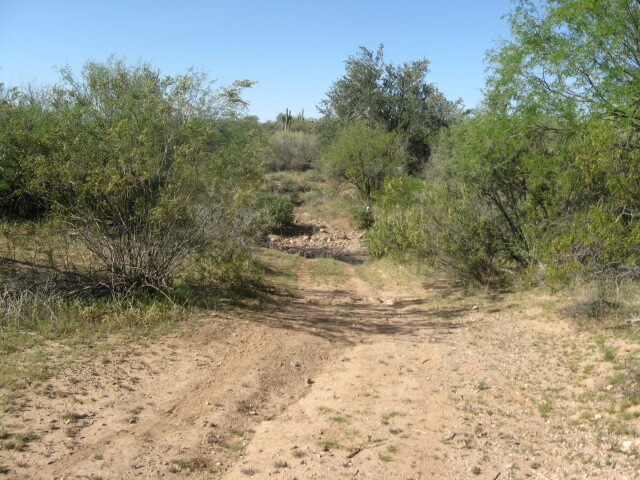 I found a way off the main roads and a little trail leading into the Arizona brush. 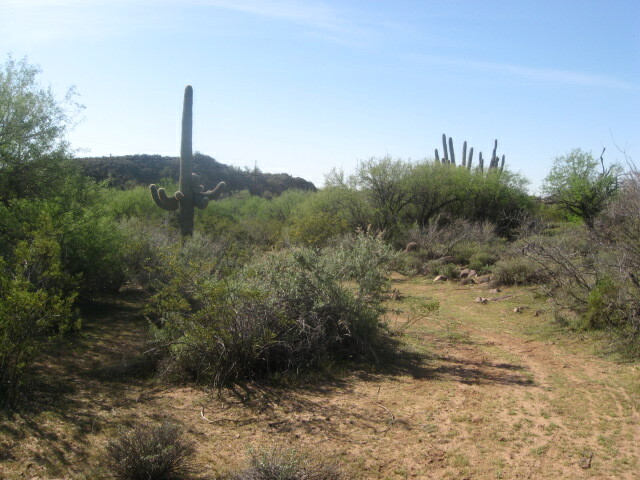 The desert north of Phoenix and at a higher elevation is a great place to find the saguaro cactus. At this point I parked the car and continued on foot. All I really want to find are a few good sedimentary or metamorphic rocks with stripes built in. 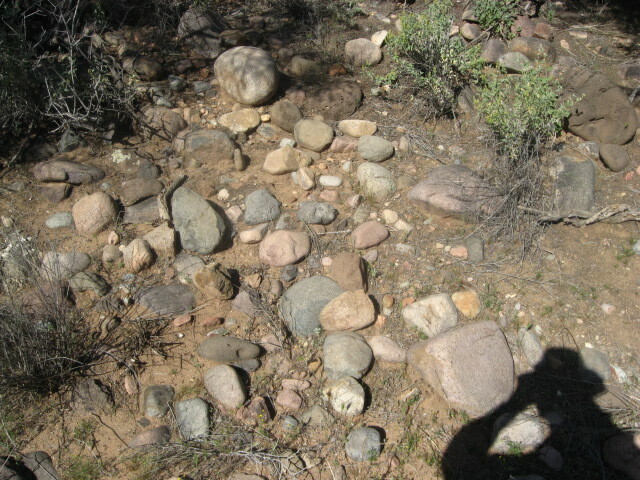 Typical rock field. No luck. Proof I’m there. My shadow with Trollgod’s hat. 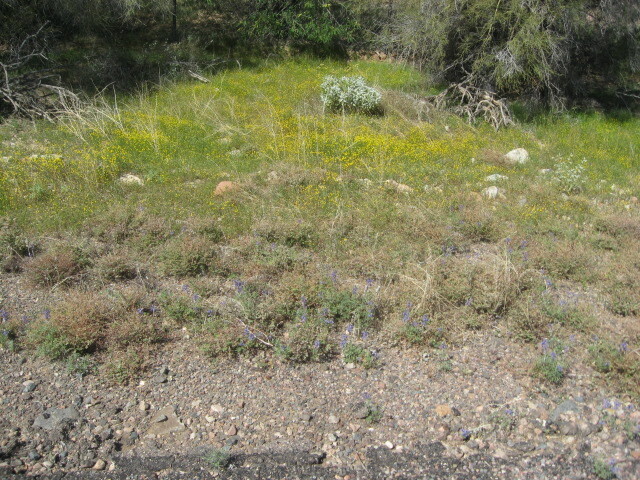 Desert wildflowers in the spring, predominantly yellow. 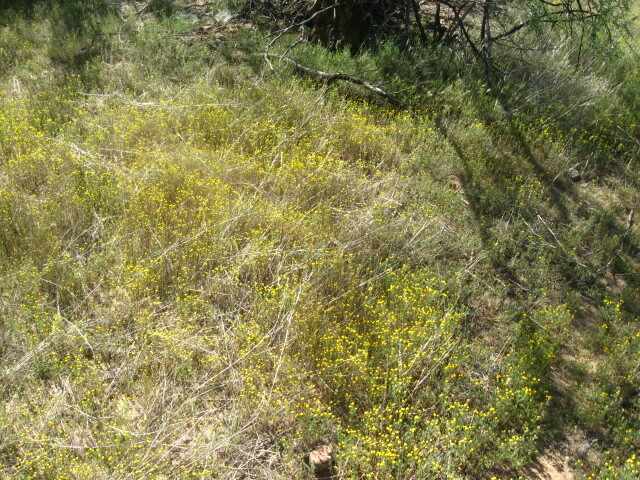 I saw a rabbit hop into this thicket but the camera is way too slow to catch the rabbit. Suddenly I heard a strange whirring noise not far from my feet. Hello, Mr. Rattlesnake! This picture is actually taken after I took about 3 large steps backwards. And back a little more. He did not seem inclined to relax while I was anywhere near. 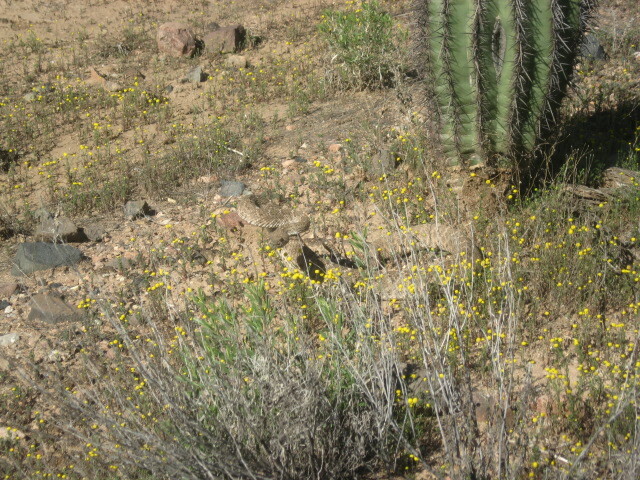 This is a brown diamondback rattlesnake. If you look closely you can see the distinctive diamond patterns on its body. 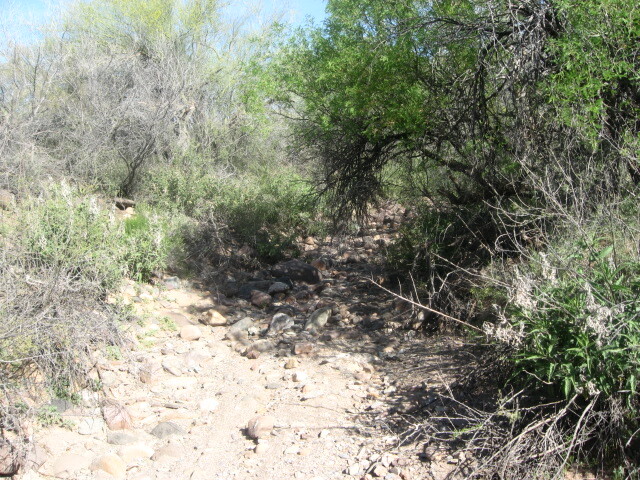 I headed back toward the car and into a wash, thinking there might be some better stones there. I really like walking in desert washes. The scenery is so variable. 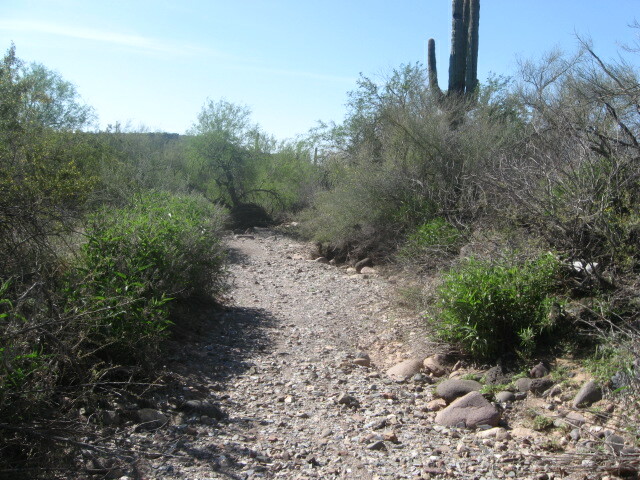 I left the undergrowth and headed into New River. 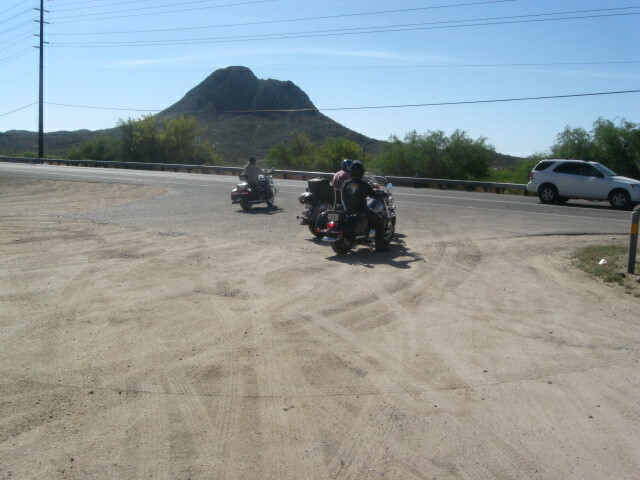 There were some bikers enjoying the early morning sun and breeze. 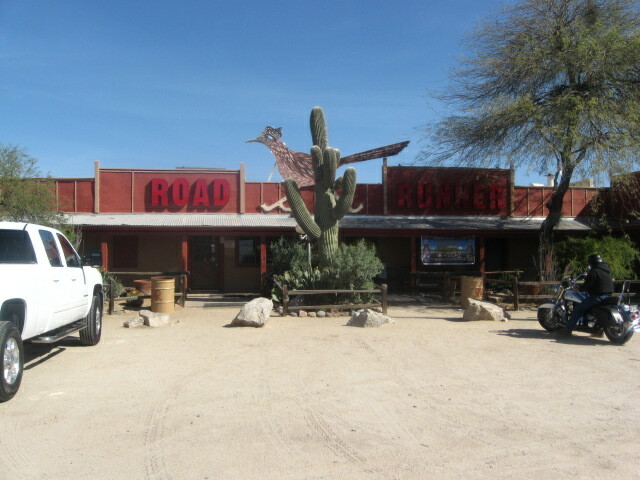 I decided to stop for breakfast at the Roadrunner Cafe. 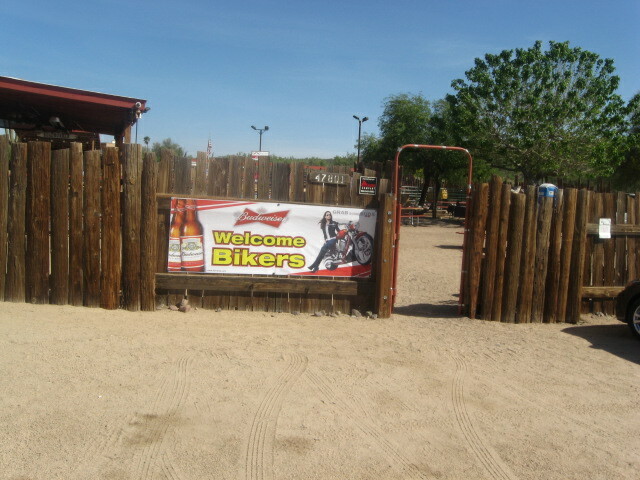 This is THAT desert bar for bikers you see in all the road movies. 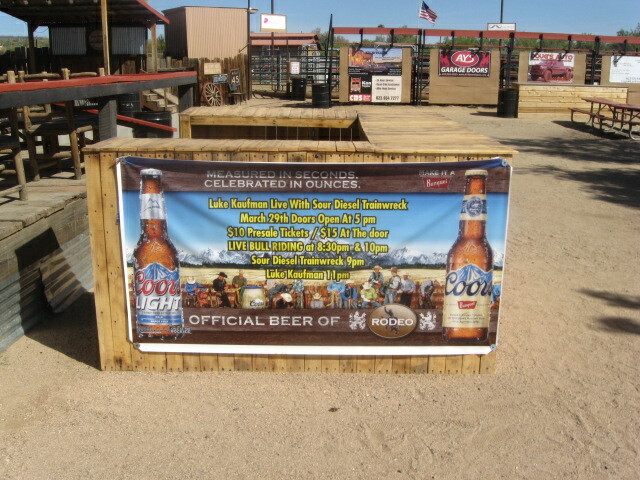 Beer, especially cold beer, is very important in the desert. 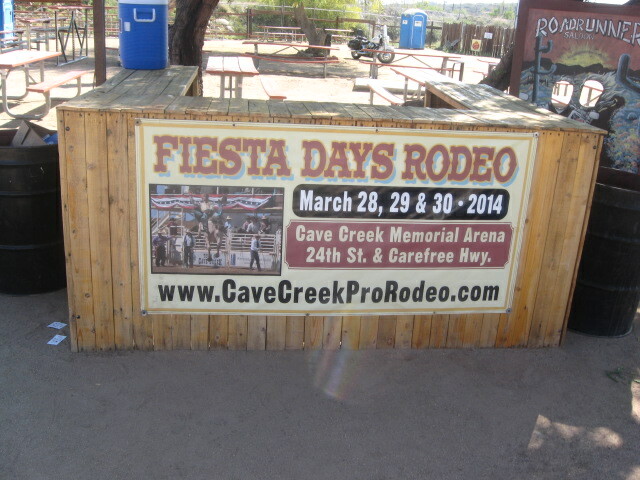 Little rodeos still thrive out here away from the big city. 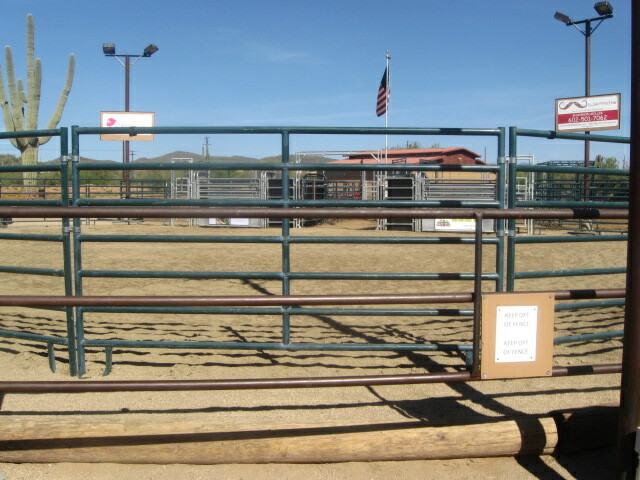 Here’s the corral where the bucking broncos show their stuff. 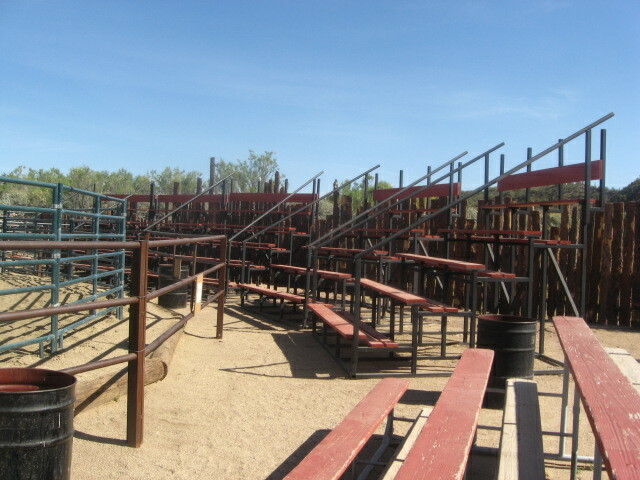 No seating discrimination at the New River rodeo. They all cost the same, and they all feel the same and everyone is close to the action. What good entertainment facility doesn’t have a space for musicians? 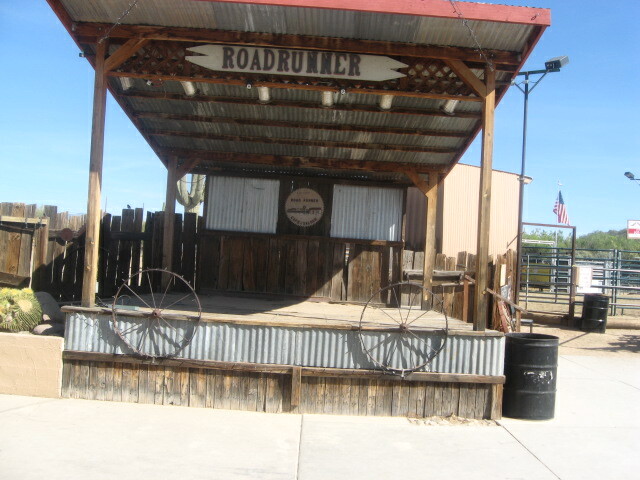 Here’s a western stage. The main business is the restaurant. In nice weather the good seats are outside on the patio. 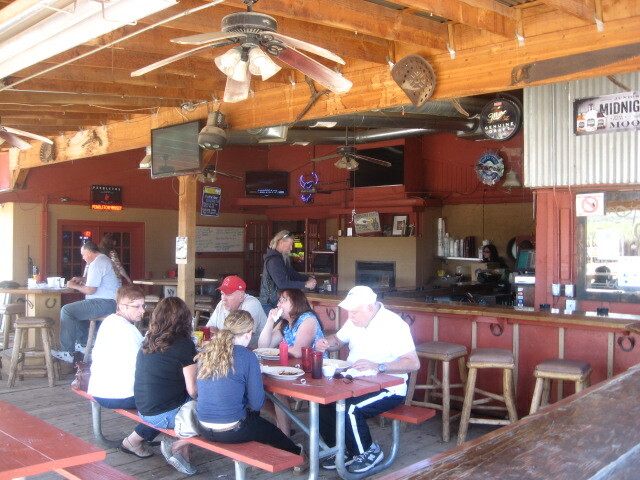 Here’s a look at the bar. Look at that assortment of beers! 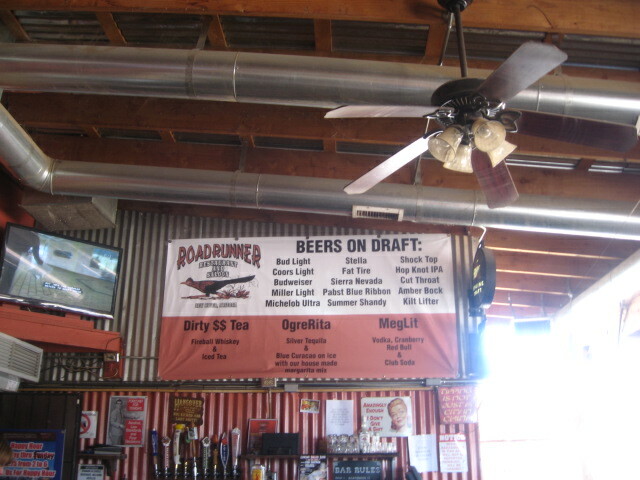 Some time when I’m not driving, I’d like to come up here and try some of those flavors in the second and third columns. Bartender, boss, manager is slicing lemons for the day. 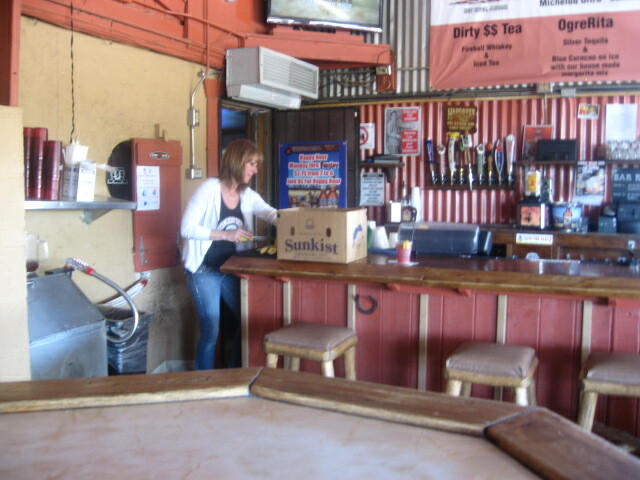 I don’t know for sure that she’s the boss, but she was telling the other waitresses what to do. I ordered black coffee. It came in a styrofoam cup. Things are basic in the desert. Why waste time, water, and money washing coffee cups when styrofoam is cheap. 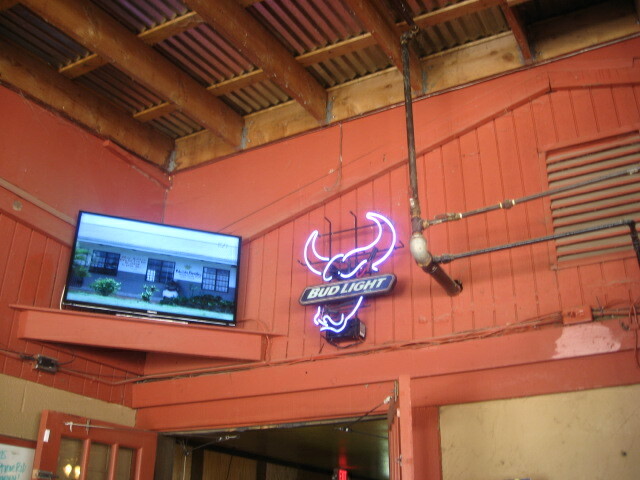 I kinda like the neon bullhead used as a Bud Light sign. This bar has all the modern conveniences, too. Big screen tv for those who want to watch sports. Just inside is a pool hall with 3 tables. Dang! 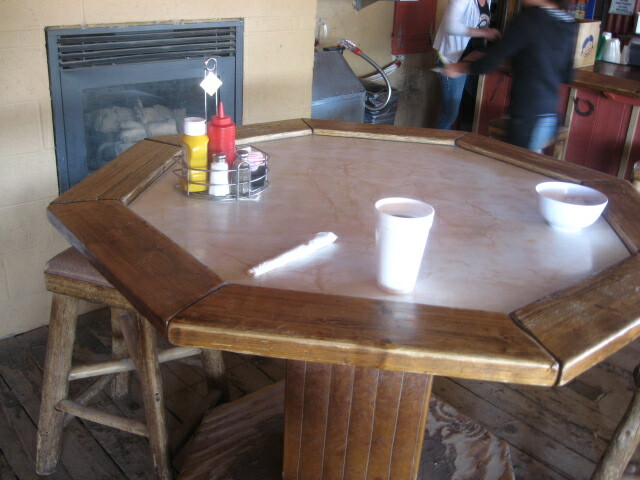 Made me want to play pool and drink beer. Breakfast finally came. 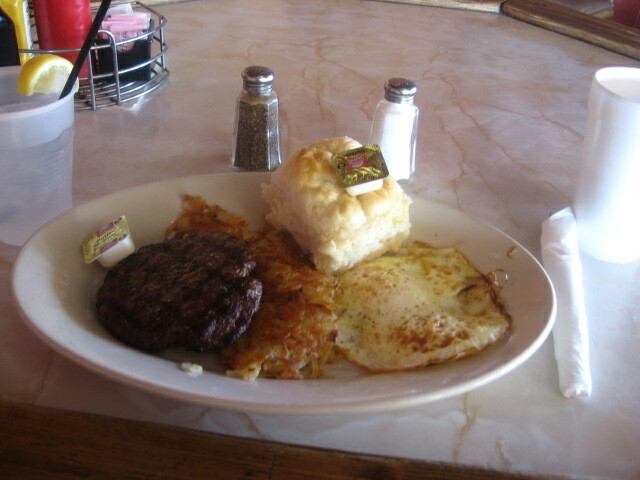 Two fried eggs, hamburger patty, hash browns, and the largest fluffiest biscuit I’ve ever had. So good! Worth driving 20 miles and paying $10 just to have it. Country bathrooms remain politically incorrect. These babes are on the door of the Men’s Room–I had to visit it before hitting the road again. The Ladies Room door was decorated with hunks–at least the outside was–I didn’t see the inside. 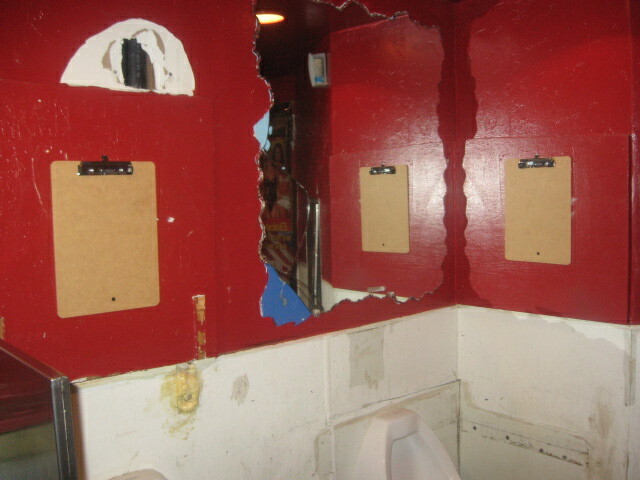 The mirror is a little chipped up, or someone went to a lot of trouble to give it that ragged outline. 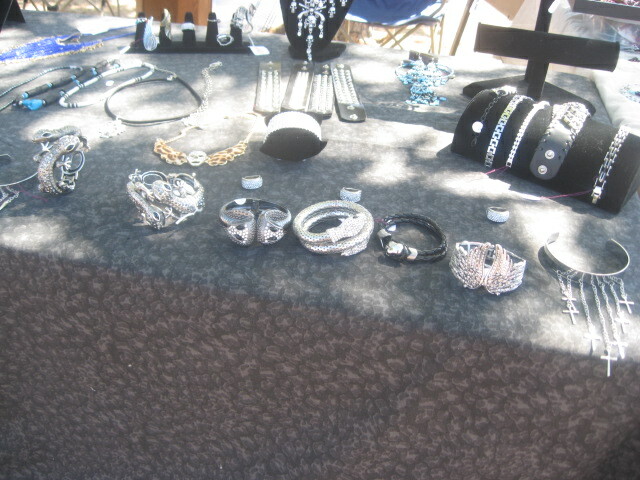 This lovely lady makes and sells rhinestone jewelry. I didn’t buy any. What’s the point? I have no one to give it to, though if a lady admired it in my presence I might get her one. It’s cheap and flashy, but I like it. I stopped to admire this motorcycle. Beautiful black–what a great ride. 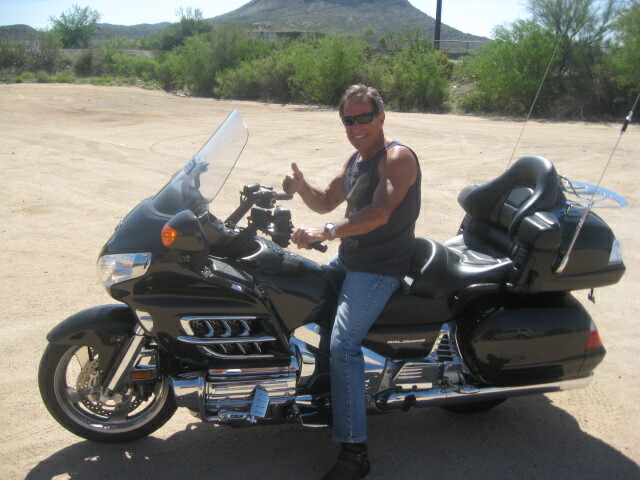 The guy is named Soto, rode up from Buckeye with some friends. I found some big beautiful yellow flowers. 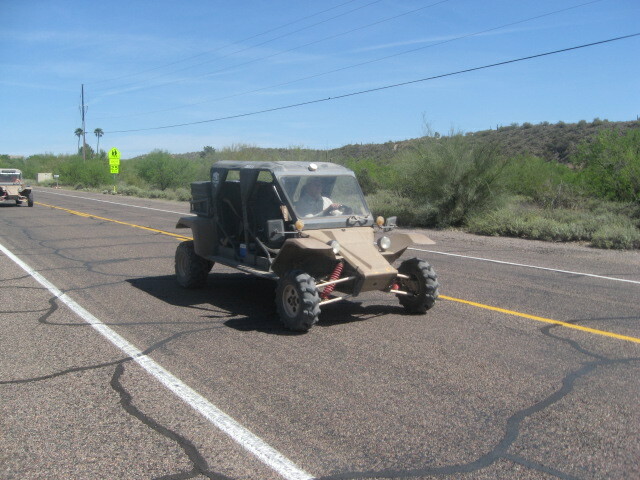 I saw desert dune buggies out for a ride. Looked like fun. Got a thumbs up from the passenger in the second vehicle. I think it might be safer being a flower photographer than a desert wildlife hunter. The closest thing I found to a striped rock. I decided not to bring it home with me. 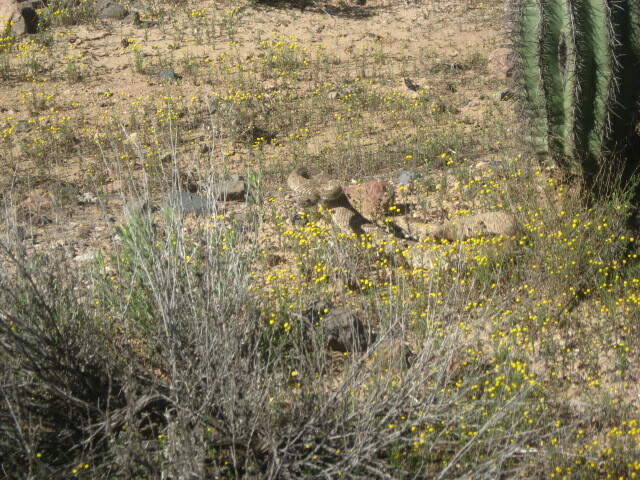 Also some tiny yellow desert wildflowers. 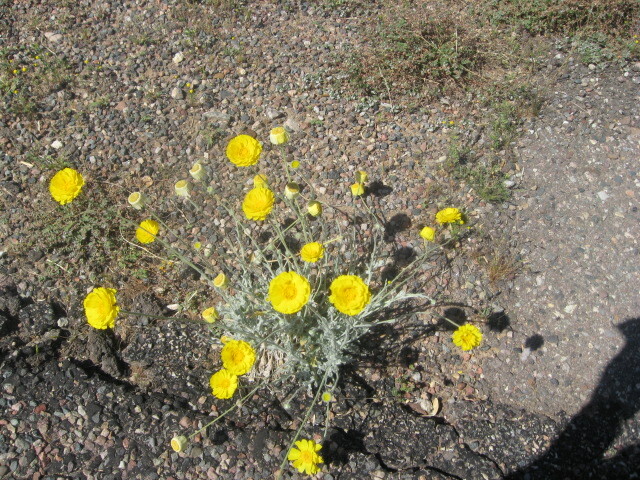 Not all desert wildflowers are bright yellow. 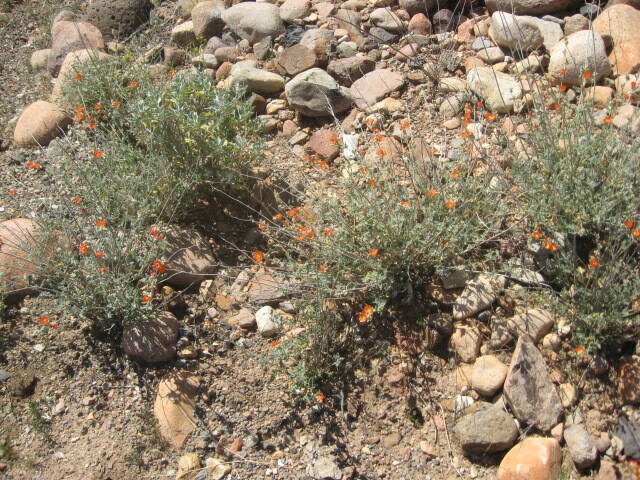 These little desert buttercups are golden orange. 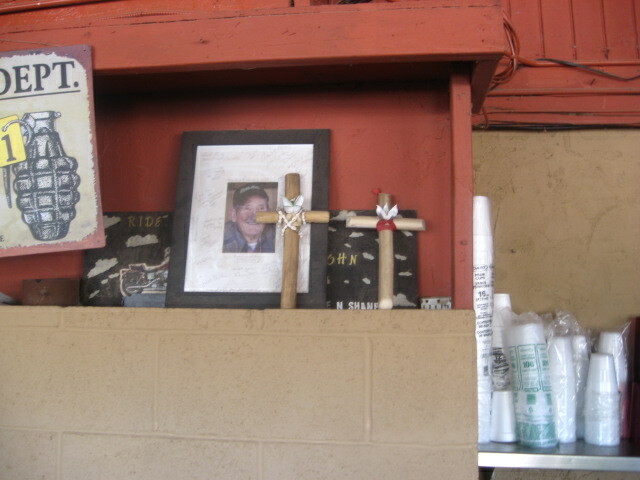 A piece of twine, a flat rock, and a chewing tobacco tin. 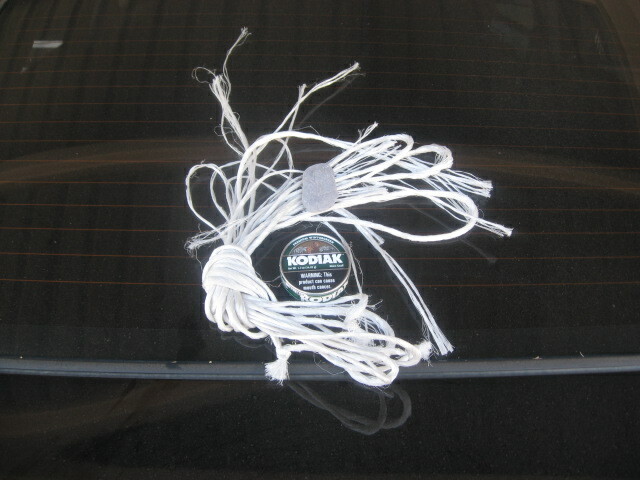 These were my roadside finds for the day, and the photo is taken on the trunk of my Kia. I kept the twine and the rock, washed the tin, and then decided to throw it away. I have no use for chewing tobacco, and it had a strong odor, not unpleasant, minty actually. The tin says: Warning: this product can cause mouth cancer. Even though I don’t like tobacco, I thought the package was rather elegant. And that was my big adventure for Saturday. It may not seem like much, but I just really like to get out of the house and see places that I’ve never seen before. It’s not so much seeing–it’s being there that satisfies me emotionally and makes me feel good about life in general. If you like to wander out into the countryside and see how other people live and have breakfast, or if you’ve ever been up close and personal with a rattlesnake, why not leave a comment?